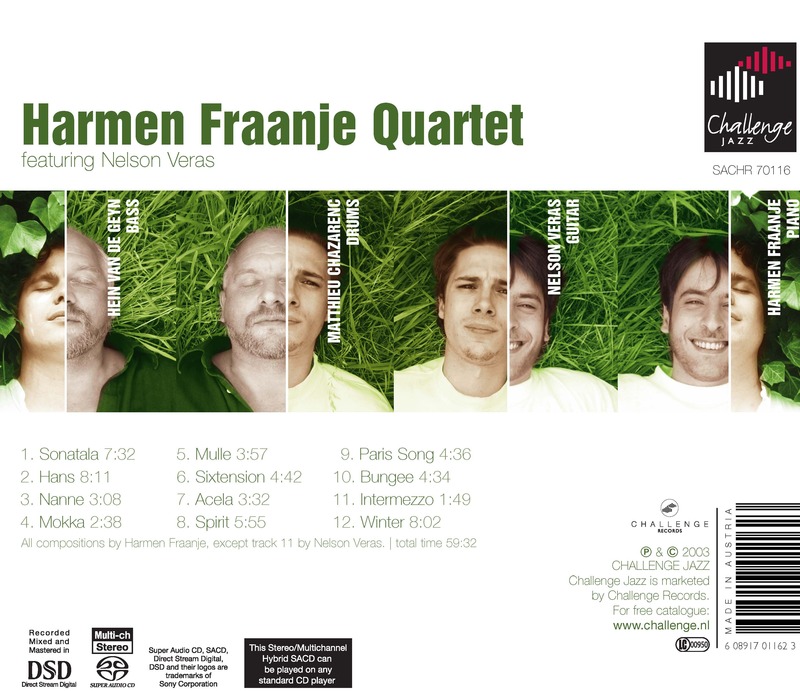 The quartet of Harmen Fraanje was founded in the summer of 2002.Hein Van de Geyn invited the musicians to his theater where they spent an extraordinary week together. The music of Harmen found a miraculous medium in this group. The phenomenal brazilian guitarist Nelson Veras was able to add just that magic colour to the already sparkling sound of the piano trio. Nelson Veras,who already as a teenager toured with people like Pat Metheny,Aldo Romano, Gary Peacock, Michel Petrucciani, grew into one of the most promising guitarists in the world.His fabulous technique and effortless musicality are truly amazing. Hein Van de Geyn is a well known and seasoned bassist. His 20 year long experience give him the ability to push the group from his place in the back to extraordinary heights.His flexibility and sense of improvisation give a special colour to the group. Drummer Matthieu Chazarenc is at this point one of the young lions of the Paris Jazz scene that is most in demand.He only arrived on the scene a few years ago. His intense polyrhythmical way of playing is an exciting factor within the sound of the band. The music of this extraordinary quartet has a power and simplicity that hits the listener in a very direct way. Within the refreshing, clear compositions breathtaking improvisation takes place.As one of the most promising upcoming quartets we wantedto fully support the beautiful sound of the band with the best quality format.Challenge therefore decided to release this album as a hybrid surround SACD only.